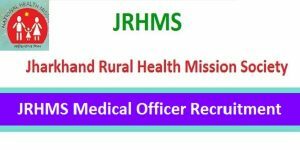 Recently on JRHMS MO Recruitment 2018 notification of 24 Medical Officer cadre jobs was posted by Jharkhand Rural Health Mission Society(JRHMS). Through official site of JRHMS www.jharkhand.gov.in notification and application form format or bio-data form is given. Interview is the selection process of this recruitment. So you can attend interview with filled bio-data form from 14th Feb to 16th Feb 2018. JRHMS MO Recruitment Notification 2018: In this article, candidates can also get the maximum information respecting to the recruitment Notice. Kindly check out the complete official notification from 30th Jan 2018. The Jharkhand Rural Health Mission Society wants to select the candidates by conducting the Document verification & the Interview Round. For this process, all the candidates have to register for the JRHMS Recruitment Board. So, almost the application was in progress. The Selection process started on 14th Feb 2018 to 16th Feb 2018. For this selection process, the JRHMS which is formally known as Jharkhand Rural Health Mission Society has to take the initiation to selected the candidates who are well & talented for this Medical officer Post. For this post, candidates need to the minimum of Experience to get on this JRHMS MO Recruitment. Post Name: Medical Officer (Ophthalmic Surgeon-NPCB, Pediatrician DEIC, Specialist Cardiologist / General Medicine & Psychiatrist NMHP ). Relevant years of experience in the related field. Official Website: @ www.jharkhand.gov.in / www.jrhms.jharkhand.gov.in. The complete qualifications for JRHMS MO Recruitment notification as per the job wise. Selected candidates will get the pay scale as per the norms of the JRHMS MO Recruitment 2018. Visit the official website of @ www.jharkhand.gov.in / www.jrhms.jharkhand.gov.in. Apply 24 NRHM Jharkhand Medical Officer (MO) Job Vacancies: Don’t skip the page. Jharkhand Rural Health Mission Society is mainly selected from the candidates who are completed & have the experienced in the Medical Department. So, who are Interested can have the application form on this page. Who want to know the complete details of the NRHM Jharkhand Medical Officer (MO) Recruitment Notification. They have the chance to get the link which is in the below of the article. candidates have the time to register. Most of the job aspirants can also get the syllabus on this page. So, for the sake of job hunters can employ the details through offline for the NRHM Jharkhand Medical Officer Job Vacancy from now on wards. candidates have the time till the deadline. Well, based on the count of the applications Board will be announced the Document Verification. They satisfy of the Documents of the participants then, attend for the Interview. We recommended the Venue of the Interview which is on 30th Jan to 14th Feb 2018. . So, who completed the registration process immediately, check out the updates of the NRHM Jharkhand Recruitment Board. We give the application details on this page. If you really need that information kindly check once to submit the form.